For this year Rhodes was chosen for our yearly orchid journey, to the island of sun. There were 17 persons that met at Arlanda, Stockholm, for further transport by SAS to Athen. Here we met the last two members in my group who had explored Athen for a couple of days. Now we were 19 persons that used Aegean Airlines domestic flight to Rhodes Airport were our five cars waited. So far all had followed our plan but now we realized that our map for Pefkos, were our apartments was, was left at home. 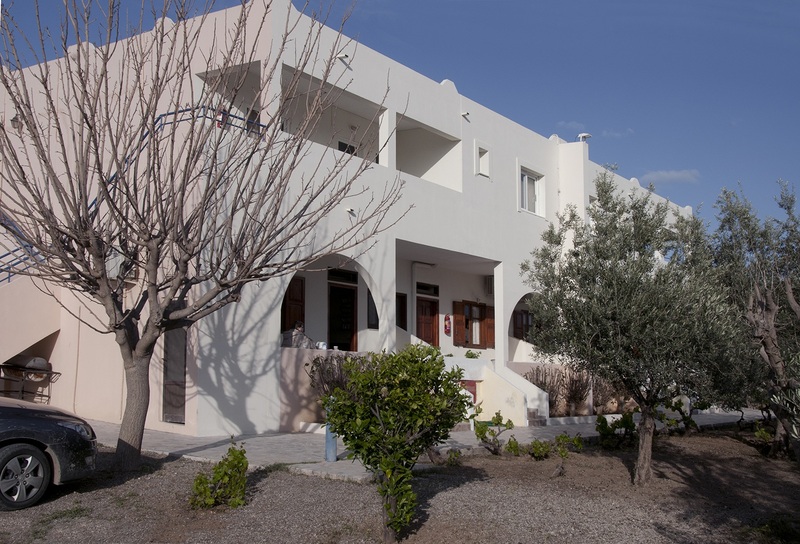 But no problem, hole Pefkos showed up as a holyday resort and the first we saw was a big sign with “Chrysanthi Studios – Apartments”, which was our destination. Our host, the young Vangelis, turned out to be a nice and talkative man who said he could handle most of our wishes. Usually the facility did not open until May 1, so it was only for us this early opening was done. The weather during our week was nice. Some showers the first day was followed by mostly sunny and warm weather rest of the week. Some days, especially in high levels, it was windy. 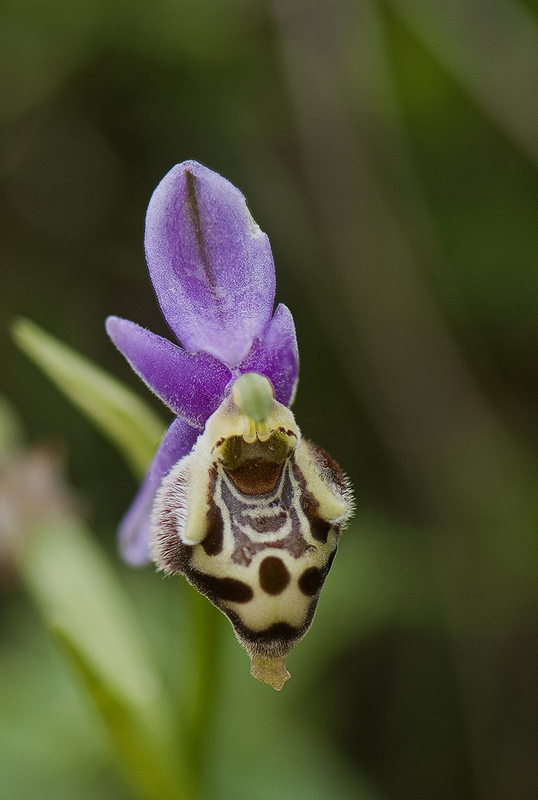 So there was problem with photographing slender Ophrys plants that only stood still for parts of a second. We found that forest fires are commonplace in these areas. Everywhere we could see larger or smaller areas that were burned out. Here the typical forest flora quickly disappears in favor of light and dry-resistant plants. Older areas were rapidly colonized by Cistus, but eventually phrygana was formed with its typical bush and herb flora. This type of landscape was the most common outside the cultivated or wooded areas. The season seemed to be quite normal this year, which meant we found most of what was expected. There were at a lot of sites, in the lower lying areas, that plants were completely withered and therefore couldn’t be named. 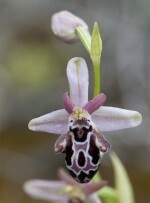 This, however, is natural when some species begin flowering very early, for example Ophrys cinereophlia, O. leochroma, O. leucadica, O. sitiaca, Anacamptis collina, Neotinea lactea and others. 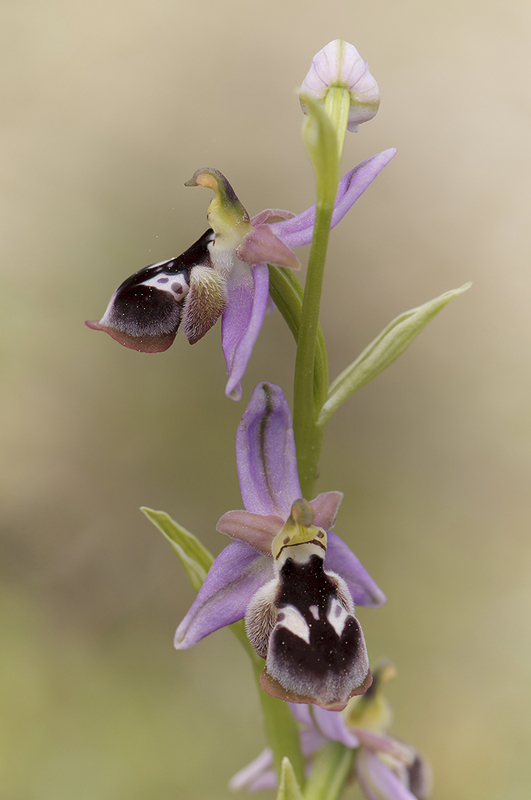 However, we found several of those flowering when we visited higher-lying areas. Within these areas, there were Ophrys plants that still had very small buds and therefore were not possible to name. 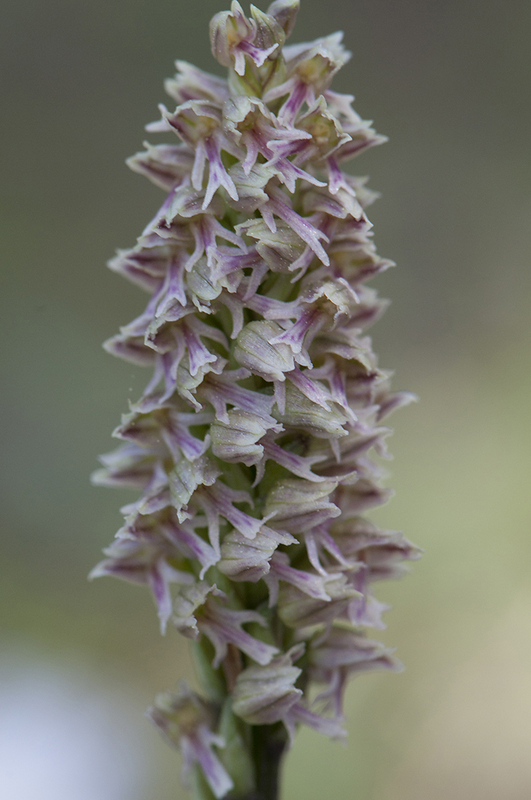 Also quite common there were leafs and small buds that probably belonged to Anacamptis coriophora subsp. fragrans or A. sancta. Other species that usually are flowering later than the time of our visit (even in the lowlands) were therefore not found at all. 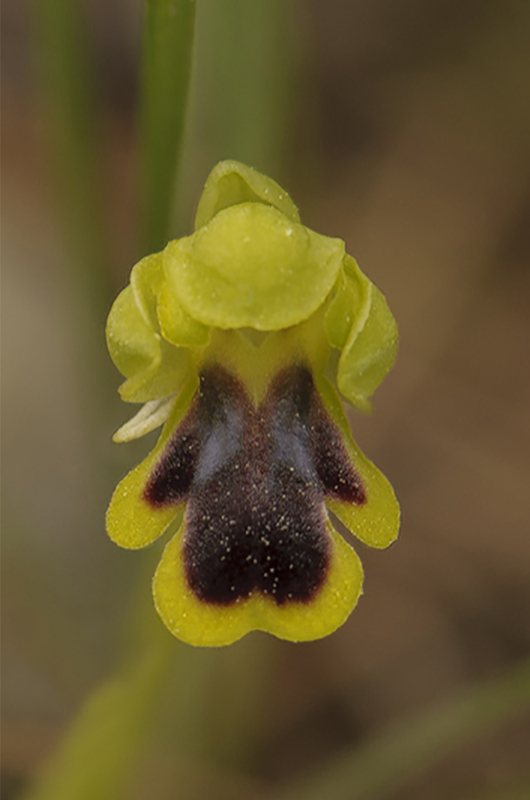 So, even this time we missed Anacamptis sancta, which is quite common in Rhodes. 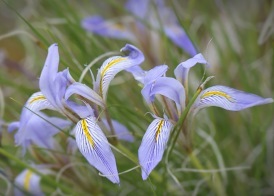 Other late flowering species are e.g. Ophrys colossaea and O. apifera, those are the last flowering Ophrys species. A total of 46 species were found during the week, which may be considered a very good result. All were seen with flowers even though, as with A. collina, there were only a few flowers in the top or as with O. rhodia who hardly had more than a single first flower open. In addition to the 46 species, three albino variants, A. papilionacea, A. pyramidalis and A. collina were also found. 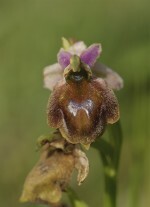 As expected, the new species in the Ophrys heldreichii- and fuciflora-group caused problem for us. In some cases research back home is needed to be sure of what we saw. In the Ophrys fusca-complex there were also some doubts around O. attaviria / leucadica / lindia. Here too, the picture results from certain sites need to be studied further. 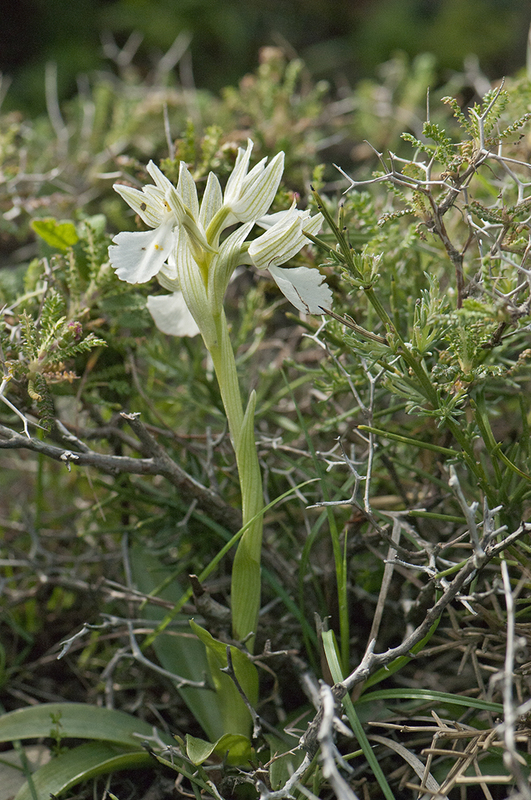 Usually there are problems with Serapias, but in Rhodes there are only four species, three of which are easy to keep apart. Only S. police are uncertain. We did not try to differentiate this but all of that type was called "bergonii" in our notes. 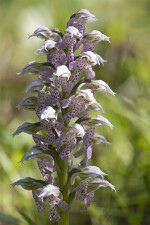 Orchis italica was found in several places with spotted leaves in the leaf rosette. Usually, these are pure green. 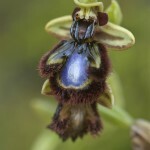 Ophrys regis-ferdinandii did not have the blue mirror here as with the populations we saw at Chios. All we saw on Rhodes had reddish (or gray) mirror. 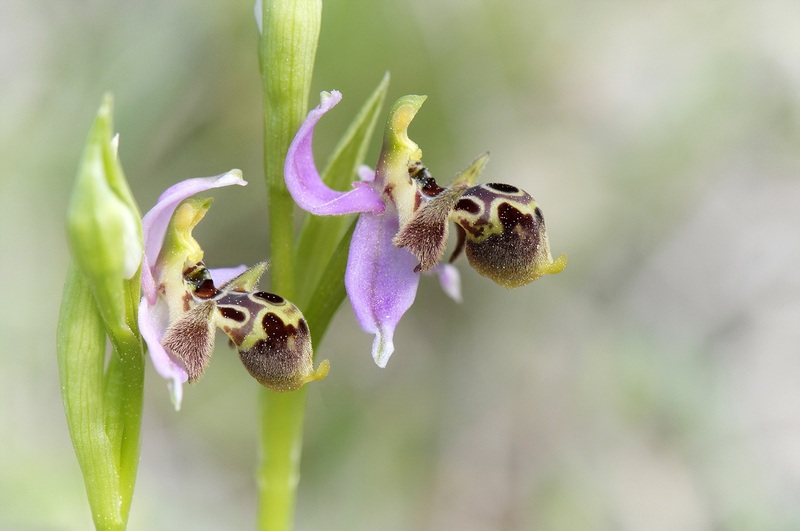 Ophrys speculum differed greatly from those we are used to from the western Mediterranean. The mirror was much darker blue and the hairiness around the lip almost black compared to the bright brown to the west. The eastern population is sometimes called "subsp. orientalis ". Below are descriptions of our daily excursions and what we found. Because rain was reported, this our first day, we wanted to get as far south as possible, as it seemed like it would be less rain the further south we drove. Therefore we took Route 2, from our six preplanned routes, as the first excursion. The blue-marked road shows the route. We visited sites 1, 2, 5, 7 and another two, north of the 7th, 4.4 and 5.6 km from Katavia. The first rainfall came shortly after we arrived at Site 1 but it did not prevent us from finding a number of species. The next shower became more powerful and since most of us now were quite far from the cars there were many who became really wet. The first stop at this site was where the first hillock reached down to the road. We then continued toward the sea, about 2.5 km. Here the road divided and we searched a small area of grass and bushes, hardly more than 100 m2, adjacent to the road crossing. Despite the fact that the area was so small, it turned out to be very rich. Site 2 was the area around a small church, Agh. Pavlos, lying on a hillock just next to the road, left side. We searched the slope east of the church and the area immediately behind. 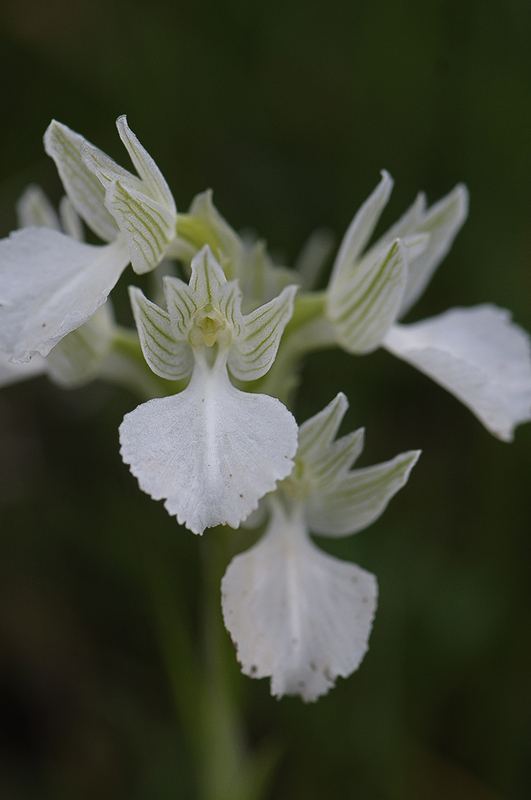 Even at this site there were lots of orchids, especially fine specimens of O. cretica subsp. beloniae as well as O. regis-ferdinandii in hundreds. On the way to next site we had, perhaps the most powerful shower for the day, but because we now were in the cars, it doesn’t hurt. We passed site 3 and drove directly to Katavia where we turned left. Here we probably choose the wrong road and drove the yellow one at the map, east of the blue marked road. This meant that we missed site 4. Anyhow the landscape looked like the one at Site 5, which was our next site. This was a bit from the main road, along a small graveled road that went toward some pylons at some hills further toward northwest. The slopes were covered with phrygana. Here we found the eastern variant of Ophrys speculum, sometimes called subsp. orientalis. 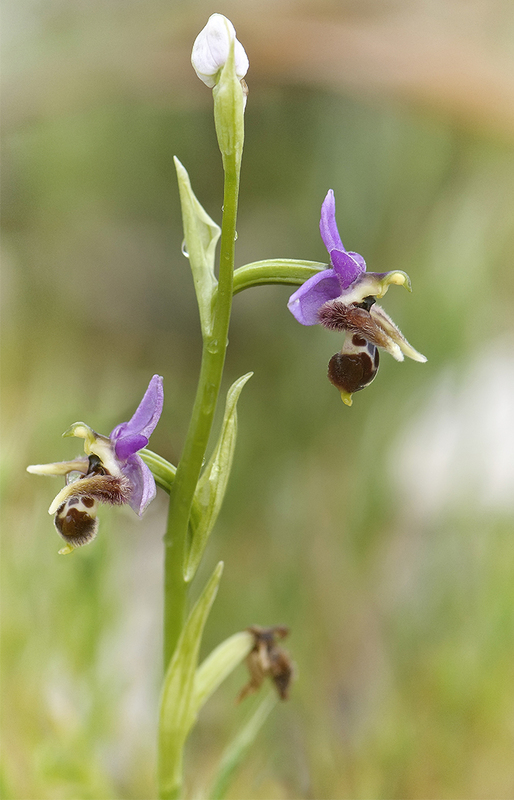 Here we also got problem with telling apart the different species from the Ophrys heldreichii-group which here could be found a lot of. Since the day began to be late we chose to skip site 6 and instead try to explore Site 7, about 1 km north of Katavia, along the road to Messanagros. The site turned out pretty poor in terms of orchids. There was, however, plenty of leafs, probably A. fragrans / sancta, to the left below the road. Another two sites, along the road to Messanagros, were visited (not marked on the map). The first, 4.4 km from Katavia, was where the road passes the highest point. 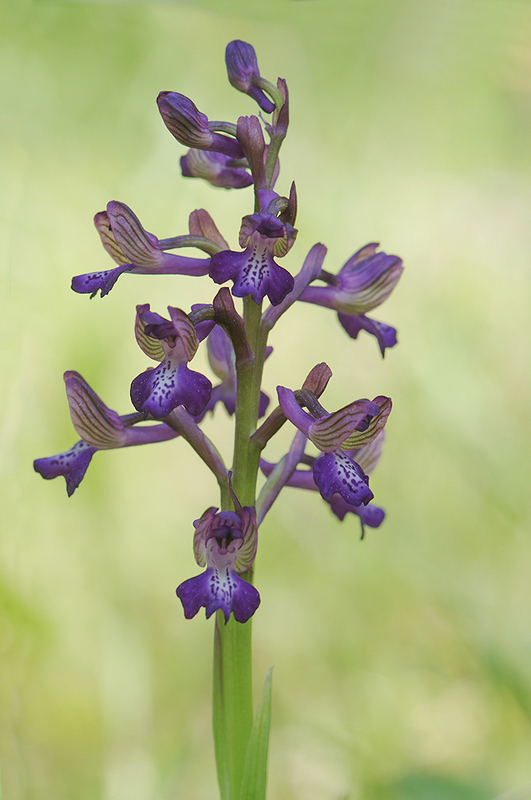 The area consisted of windblown phrygana and contained several interesting species. Here we encountered O. omegaifera for the first time. A species that later proved to be quite common. 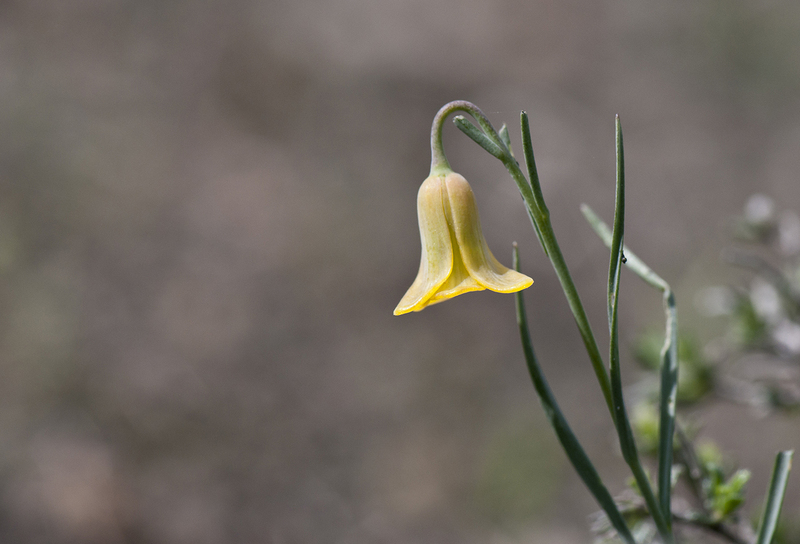 Another nice find from this local was Frittilaria rhodia, endemic to Greece (not just Rhodes). A cold blow from the northwest made it feel good to re-enter the cars. The next site was another 1.2 km further ahead (5.6 km from Katavia). 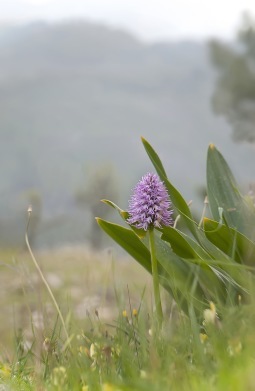 Here in the slopes, on the hill behind the little chapel of St. Nicholas, there was a very rich flora. 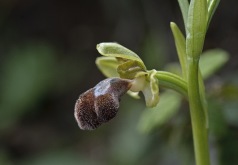 Only note of Ophrys cinereophila, during our week, was made here. 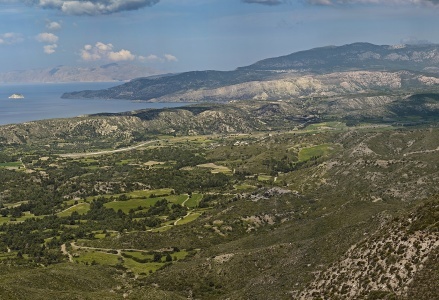 In order not to return home at the same route as we arrived, we chose to continue north to Messanagros and further eastwards via Lachania to the coastal road which we then followed home. But first we stopped at a restaurant in Lardos for a good (and very well deserved) dinner. As a note from day 1, it can be said that all roads we drove, after leaving the main road, were dirt roads and with the showers that come during the day it became quite loitering. 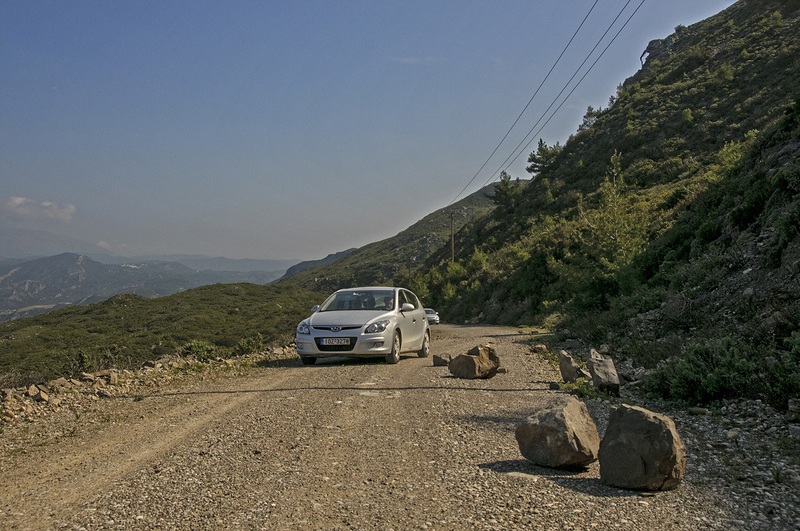 Especially the road between Katavia and Messanagros was bad. However, from Messanagros (eastward) there was asphalt road again. According our host, there could be some rain showers in the morning. But not, instead, it became a nice and sunny day, perhaps a bit too windy for those who wanted to photograph comfortably. For this our second day we chose route 1 from our preplanned routes. This one was going through the lowlands along the east coast. 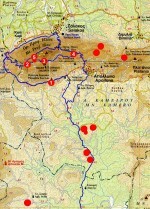 Sites 1, 3, 4, 5 and 6 was visited. 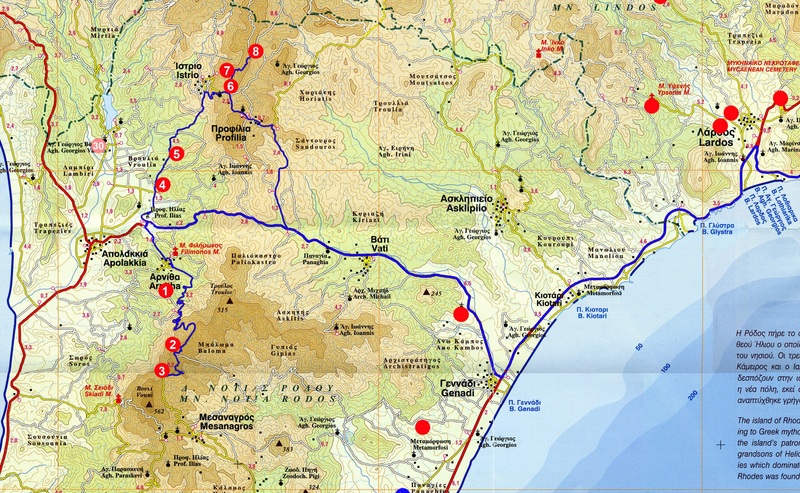 Site 1 was in a wide right-hand curve about 1.5 km after the departure road to Lardos. Plenty of parking spaces. In the middle of the curve, a trail went down to the left in a slope with sparse forest. Lots of orchids both around the "parking lot" and down the slope. 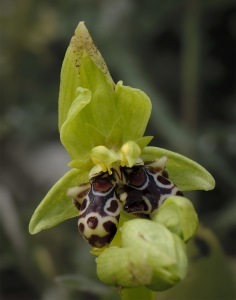 At the roadside, an Ophrys rhodia was found with "double-flower". We then proceeded to site 3, about 1.5 km northwest of Lardos. Here we drove into a small road to the left and parked in the slope to the right. The area was mostly a low hillock with short growing vegetation. 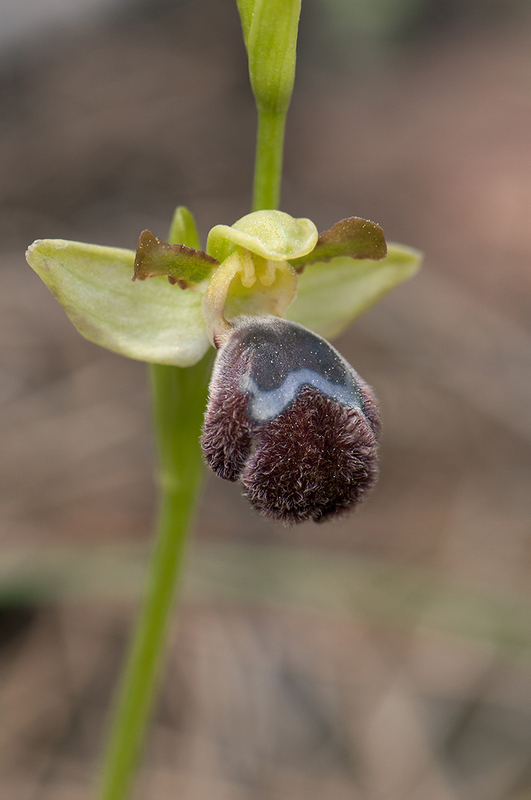 This was one of few places where we saw Ophrys blitopertha. 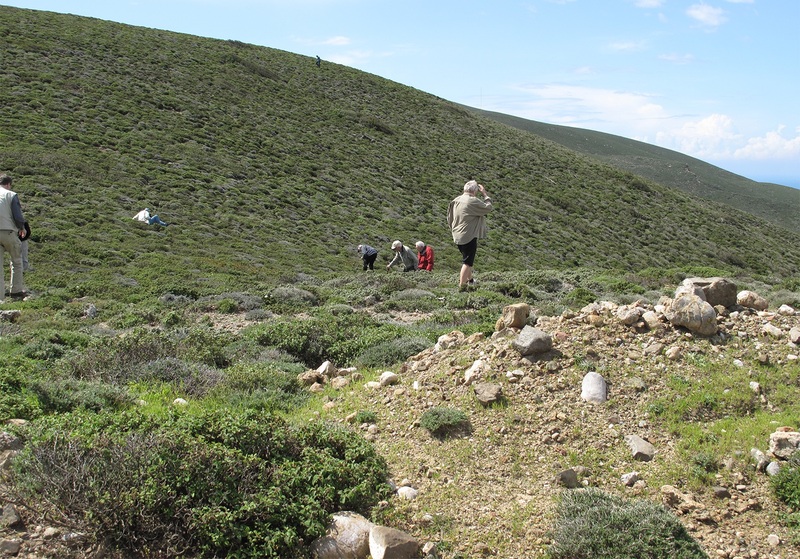 To reach site 4 (we continued for a few kilometers almost to the Monastery of Panagia Ypseni Monastery. We made a stop at the top of the hill leading down to the monastery below. Here we clearly could see how forest fires had changed the landscape. The first image is borrowed from a webpage (https://www.johnsanidopoulos.com/2012/04/synaxis-of-panagia-ypseni-in-rhodes.html) and shows how it earlier was looking like, with the monastery down in the valley and hills with green forest around. The second picture is taken at our visit and here you can see how close to the monastery the fire must have been. At our side of the monastery the forest was undisturbed and here we had site 4 which was found as a very interesting area for orchids. 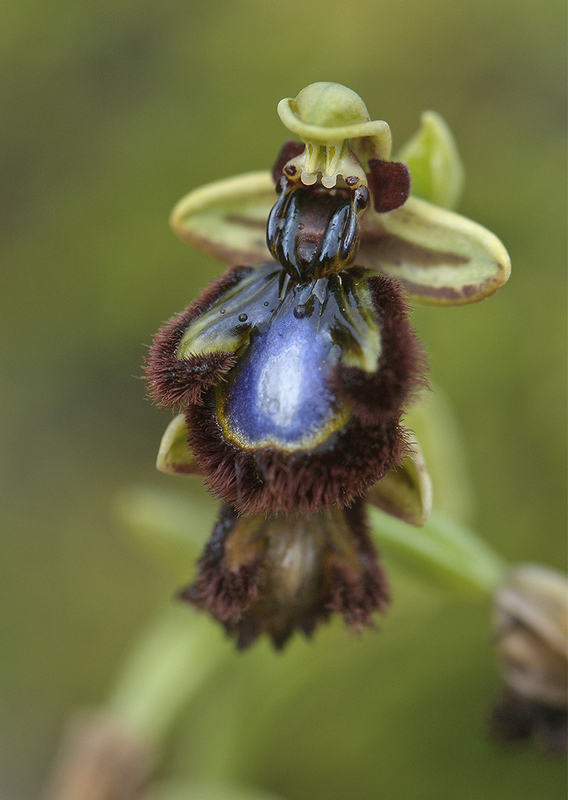 Among others, we found our first Ophrys sitiaca that here grew with its relatives Ophrys omegaifera. After returning to the coastal road, we drove south to Genadi where we left toward Vati. Site 5 was about 3 km after the road cross. Nothing new here so we continued quite soon. Site 6 was another couple of km further south along the coastal road. We then turned right into a narrow dirt road opposite the little church of Agh. Georgios at left side of the main road. The road went through a patchwork of cultivated fields. We stopped (after maybe some km) where our road met another in almost 90°. 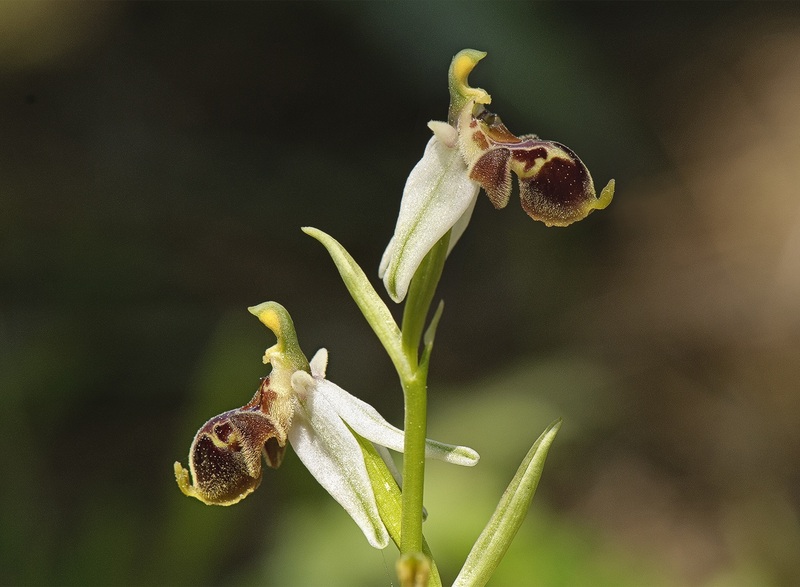 At first glance, it didn’t look like orchid land, but after little searching, it turned out as both a species and plant rich area. 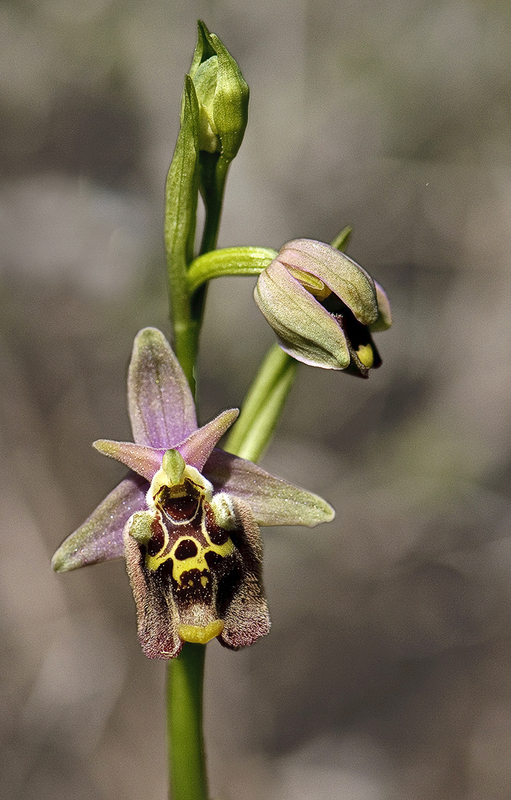 Under an olive tree there were the largest Ophrys mammosa, that we ever seen, 91 cm high! Here was also the largest amount of Ophrys cornutula we saw during our trip. 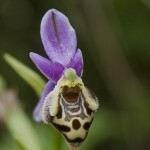 Ophrys mammosa 91 cm hög! An observation we made, which became very clear here, was that they harrow the olive groves on a regular basis, and therefore no orchids are able to grow there. But the area closest to the tree trunk they didn’t reach (or maybe for not to damage the root system of the tree?). So just below the crown of olive trees it can be profitable to look. This became the last stop for the day and the return to the hotel, which we already started to feel as "home", went the same way as we came during the day. Already in the morning we had agreed with the host's mother that we would have dinner at the hotel this evening. She would show up a Greek buffet which we now could enjoy. A good end to a great day we all agree. Tuesday came with excellent excursion weather, sunny and not so windy. 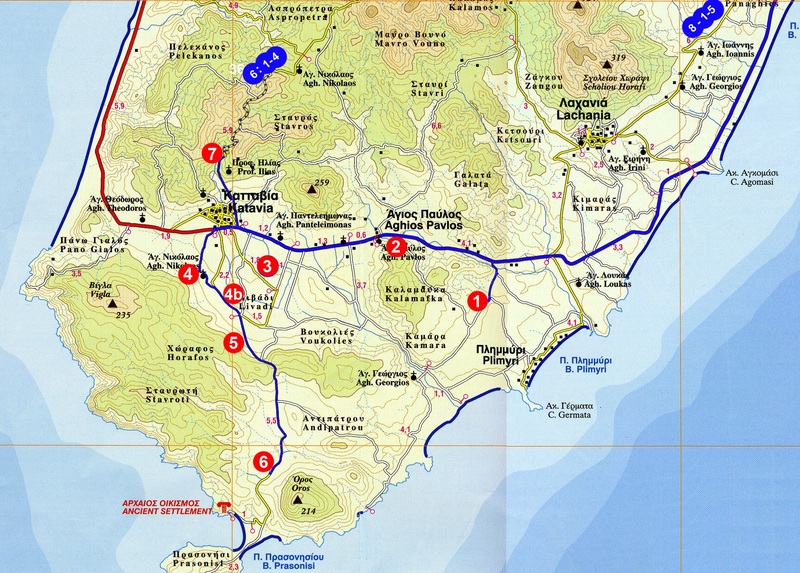 We therefore decided to choose the route up to Mount Profitis Ilias, Route 5. 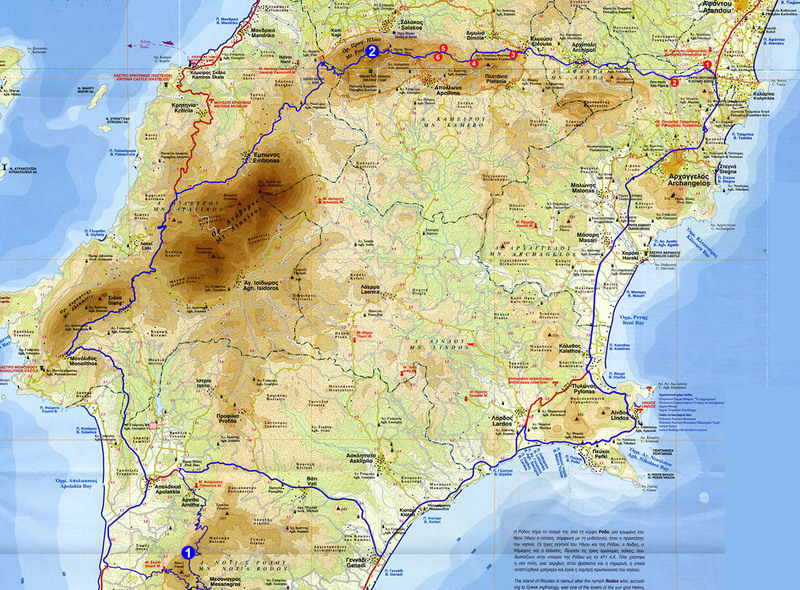 We searched sites 1, 2, 3 and a few sites along the road Laerma - Apollona. 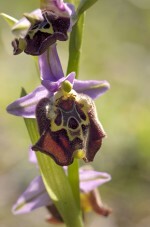 The route Laerma - Apollona are very interesting from an orchid point of view. Here we also made the first stop of the day. About 9 km after Laerma we passed over a bridge over a deep gorge. About 900 m further on, we stopped and searched the slopes to the right of the road. The area consisted of grown, sparse coniferous. From this area there are notes about albino forms of Limodorum but at the time for our visit, they were hardly more than 5-6 cm high and no flowers. However, there were a lot of other orchids to note and photograph. 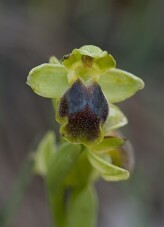 Among others, there was a large-flowered Ophrys that reminded a lot about O. episcopalis. 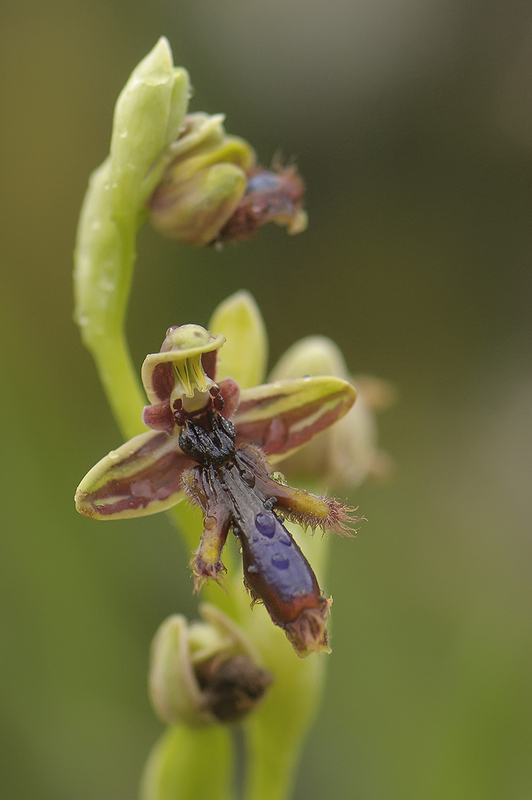 Probably this could be the newly described Ophrys saliarisii. The next stop was made at Site 1 which is located just below the little church of Panaghia Kariona. The church itself is barely visible from the road, but some walls and a water source in the forest to the right can serve as a landmark. The area consisted of sparse coniferous forest with many bushes. Here we finally found Ophrys dodecanensis, as we discussed earlier in connection with O. cornutula findings. A lot of Ophrys heterochila (oreas) was also found and enabled studies of the variations within this variable species. We then proceeded to site 2, up on the mountain. We therefore turned right after about 5 km, roadsign showed toward Profitis Ilias and Childrens Camp. After about 3 km the road divided and here we had site 2. The area consisted of slopes with sparse forest with sparse, low undergrowth, here and there were small open areas. 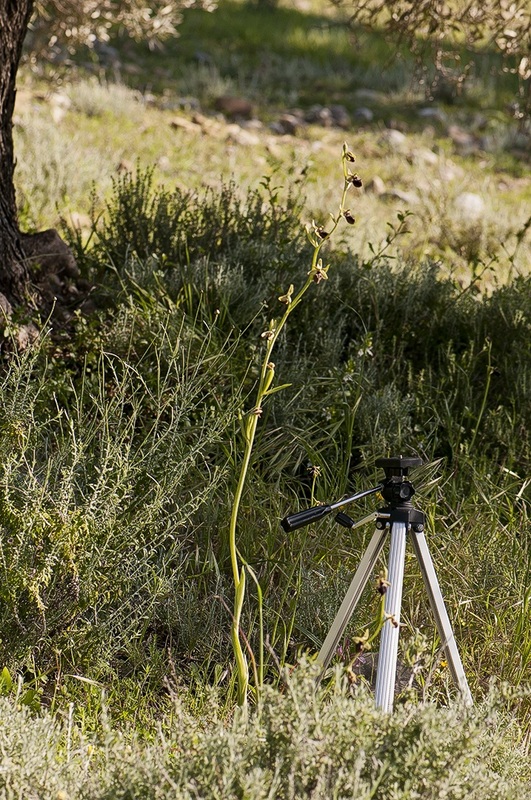 Here in this somewhat higher-lying terrain there was plenty of that for Rhodes endemic Cyclamen repandum subsp. rhodense (or maybe it should be called C. rhodense). The flower color can vary from pure white to light pink. 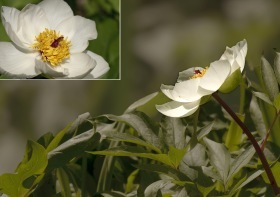 Another Rhodes endemic was found, namely the pure white Paeonia rhodia. The environment was also the right one for the Orchis provincialis that was new for this journey. After lunch in one of the sunniest glades, we continued to Childrens Camp, some kind of open-air facility, here we had site 3. But after a brief look it was found that the area was rather poor from an orchid point of view so we chose to continue toward the 4th. It turned out, later on, where the road again divided, that the road to the right that would lead to site 4, hardly was suitable for our type of cars. We therefore turned left followed the slightly bigger road north of the mountain top. Neither this road stretch was particularly suitable for our low cars, but we managed to come down from the mountain. In order not to be late for the evening, we now decided to go straight down to Apollona and further through Laerma to the hotel, the same route as we arrived in the morning. But one more stop we thought we could do. At the same bridge, at which we made our first stop in the morning, we now stopped at the other side (on the Laermas side). There a path went up through a steep hillside to the right. The area proved to be very rich. 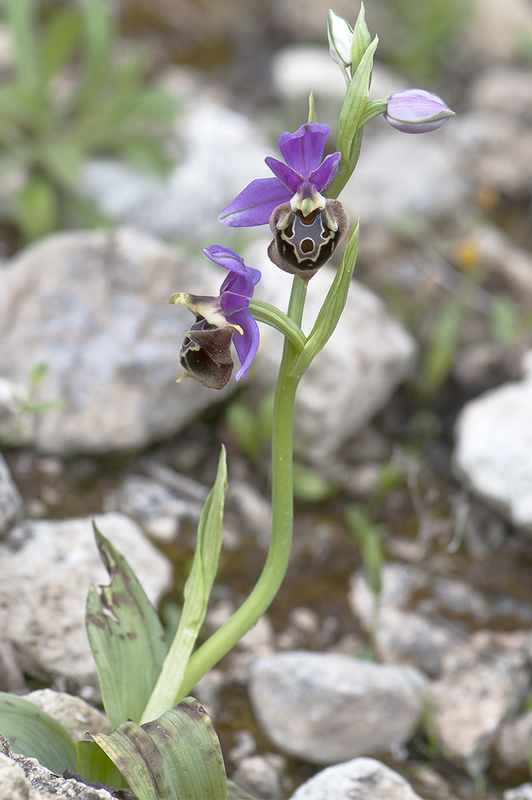 In particular, the slope to the right of the path turned out to be very interesting when we found two new species for this trip, Ophrys candica and Ophrys persephonae. But many other species were also found, e.g. lot of Ophrys ferrum-equinum. This became the last stop for the day before returning via Laerma back to our hotel in Pefki or Pefkos, as it sometimes is written. There seems to be no standard for how Greek city names should be written with our Arabic characters. Wednesday was another day with excellent weather for an orchid excursion. We chose Route 4 this day. It goes back up to Laerma but this time we would take us further west to Agh. Isidoros located on the slopes below the mountain Ataviros. First, however, we made a striker along a smaller road that led southwest to Profilia. 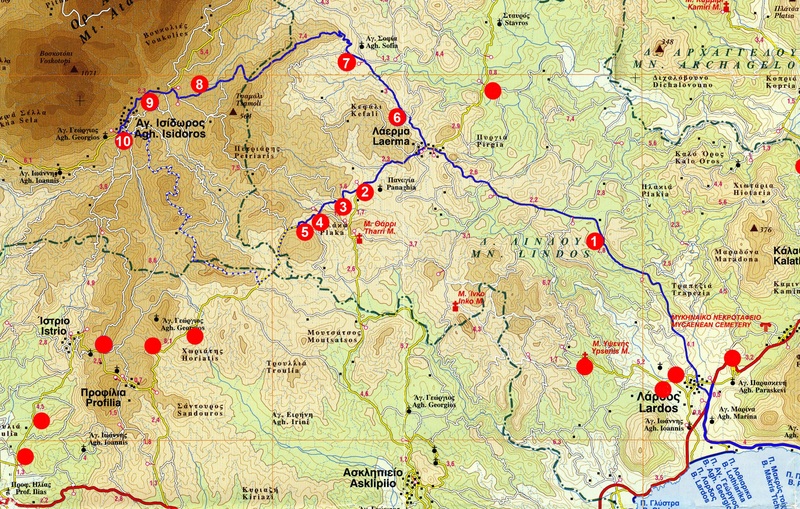 Our first stop was made according to the map's site 1, which is heading towards Laerma about 6 km after Lardos. Here we stopped at a "cabin" to the left of the road. We searched along the roadside and a bit into the cottage plot which, indeed, was surrounded by a wooden fence, but as in the corner closest to the road there was a very wet area full of Anacamptis laxiflora. 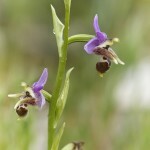 Two new species were recorded, Ophrys bombyliflora and the Anacamptis laxiflora, both rare in Rhodes. On the hilloch to the right of the cottage, besides lot of of Ophrys omegaifera, there were also some Ophrys ferrum-equinum similar to the gottfriediana variant. We then chose to drive from Laerma directly to site number 5 and then take the other sites in reverse order. Site 5 was about 4 km from Laerma. 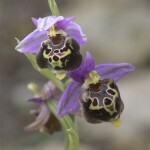 The news for this site was Ophrys lucis who was reported from here and it didn’t take long before the first one was found. This area was the only one where we found this species and it also looked like it was at the end of its flowering. But anyhow we managed to find some with nice and fresh flowers. We decided to skip site 4 and made next stop at site 3, just before a sharp right hand curve. Here we took our lunch before we searched the area. 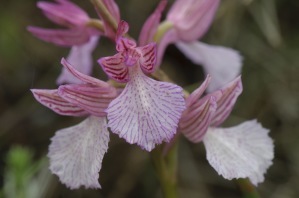 A number of more common orchid species were found but nothing new. So we continued quite soon. Even the map's site 2 was skipped. In Laerma we headed for Agh. Isodoros, toward north-west. We chose not to look for site 6 but proceeded about 2.3 km to a small church on the right side of the road and here we could park. We then searched the slopes on the left side of the road. Here too, the area was burned a few years ago so there was little left of the forest that had previously existed here. However, there were a lot of orchids even though there were no new species for the trip. A beautiful light blue iris was seen here, probably Iris unguicularis. A short stop was made at site 7 but nothing of interest was found. Another stop was done about 4.7 km from Laerma, in a sharp right-hand curve. 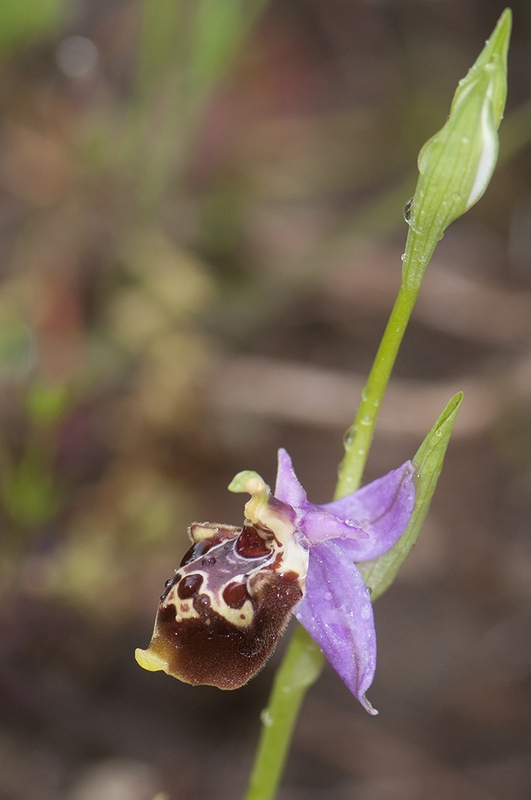 Even this stop gave no results, some O. italica were the only orchid found here. 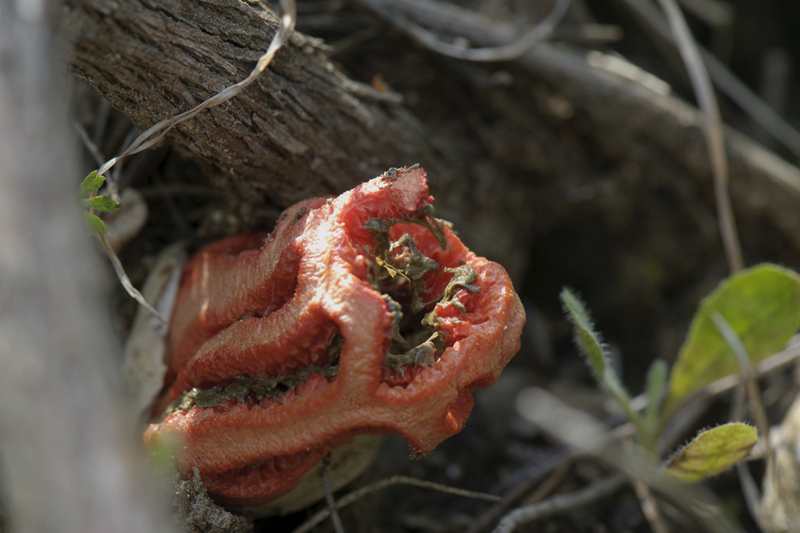 On the other hand, for mycologist, a bargain was made, Latticed stinkhorn. About 7.7 km from Laerma, the last stop for the day was done (between sites 7 and 8). Just before the top of a low hill, a small road takes off to the left and here we stopped. Most orchids were found in the area to the right, which consisted of sparse forest with large open areas. There were quite many species but few plants of each. To the left there were old cultivation terraces that had been wooded, but the forest was now largely burned. 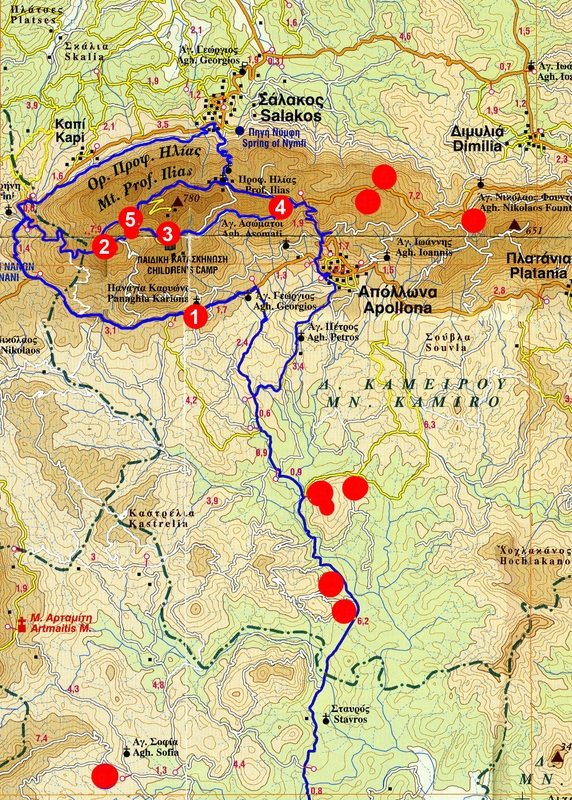 The sites 8 and 9 were skipped in an attempt to find site 10. Unfortunately, it turned out that we had entered a completely new road from Agh. Isidoros to Profilia and there was no possibility to get off the road with five cars. We therefore decided to skip the 10th as well and continue the new road via Profilia and Vati to Gennadi at the east coast and from there back to the hotel. Thursday weather was predicted to be rainy but we didn’t see any of this, instead, the sun was shining as it did recent days. Maybe it blew a little more, which became noticeable when we got up in higher areas. 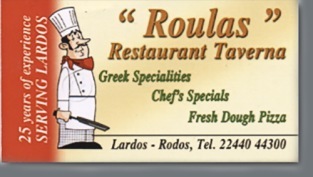 We chose route 3 that went south from Pefkos. 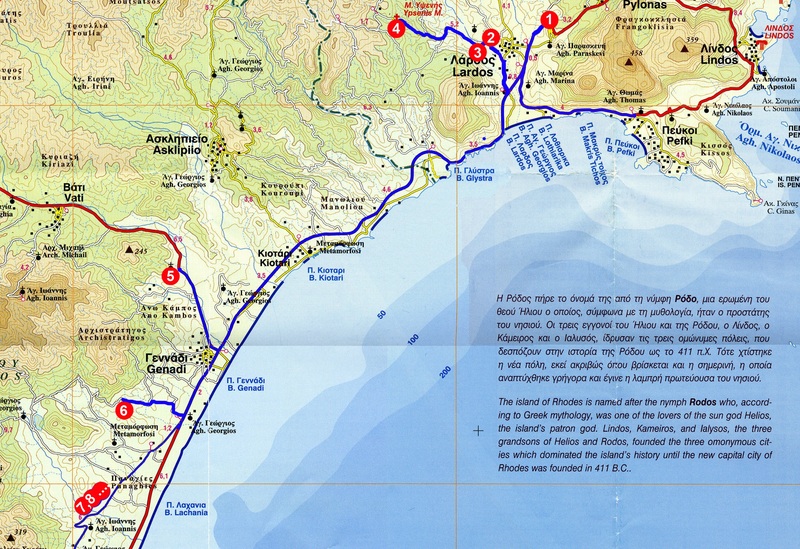 We took the coastal road to Gennadi where we turned west via Vati towards Apolakkia. Just before Apolakkia we turned left towards Arnitha and further a little dirt road (which proved to be quite lousy) towards Messanagros. We tried to find sites 1 and then 2 but either we had wrong coordinates or we did not search enough. The areas consisted largely of almost impervious phrygana / macchia. We therefore proceeded to site 3 which was at the highest point of the road below some wind turbines. 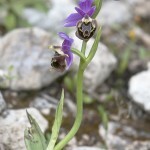 The road Apolakkia - Messanagros goes over a mountain massif with peaks well over 500 m.
The area proved to be very species rich and three new species were noted for the trip, Ophrys attaviria, Ophrys leochroma and Ophrys phryganae. 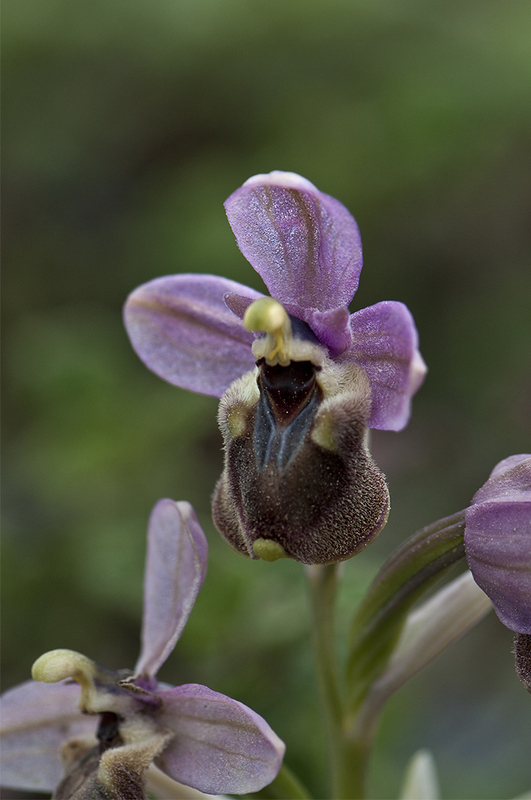 Ophrys omegaifera Orchis provincialis . That this was a windy day up here we became aware of when we got our lunch before we continued. You had to keep everything under controll so it shouldn’t blow away. But we had a magnificent view over mountains and valleys down to the sea at the west side of the island, so no one complained. Next site to visit was north of the Vati - Apolakkia road so we returned down from the mountain again via the bumpy and for rock fall exposed road, as we had arrived. We now chose a road north to Istria to search primarily site 4 which lay on the right side about 1 km after we turned off to Istria. 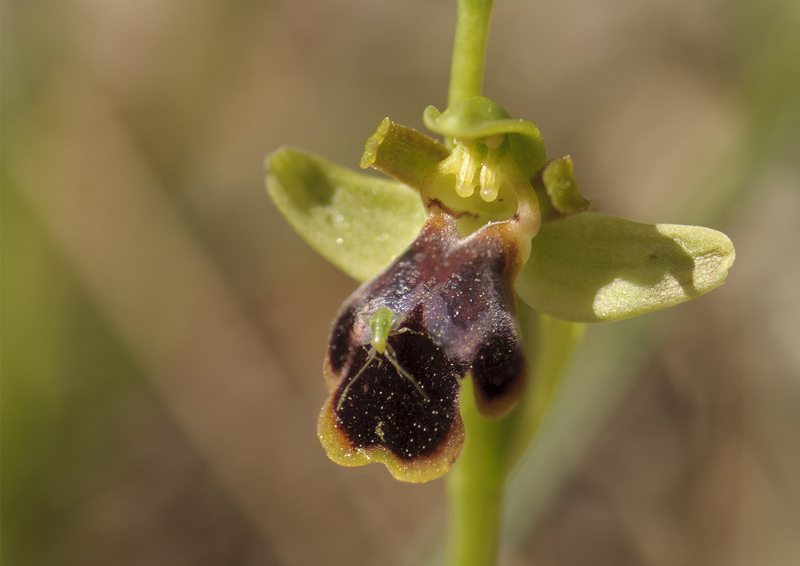 Some nice Ophrys attaviria was the most exciting here. We therefore continued another few km to site 5. Here too, the slopes at the right side of the road were searched. Some difficult O. fusca varities caused discussion about O. leucadica resp. O. lindia. The sites 6, 7 and 8 lay north of Istria along a road that went towards Agh Isidoros. We could quickly find out that 7 and 8 was along the newly established road we came from Agh. Isidoros the day before. We decided that it would be useless to drive there again and instead search site 6, which was at the junction where the new road departed from the Istria - Profilia road. Just after the crossing there was an area possible for parking. In the slopes on both sides of the road there were many orchids. This became the last stop of the day. We than drove home the same way as the day before, via Profilia, Vati, Genandi and further on to the hotel. At our well-deserved Greek dinner in the evening, a Belgian, as we had met during the day and discussed Ophrys halia with, came to our restaurant. Of course, we asked if they found the sought-after "halia”. And they had, a single plant. He also drew a map for us on a napkin in case we wanted to go back. In addition, he had marked the place with some stones in a certain pattern to do it easy for us. 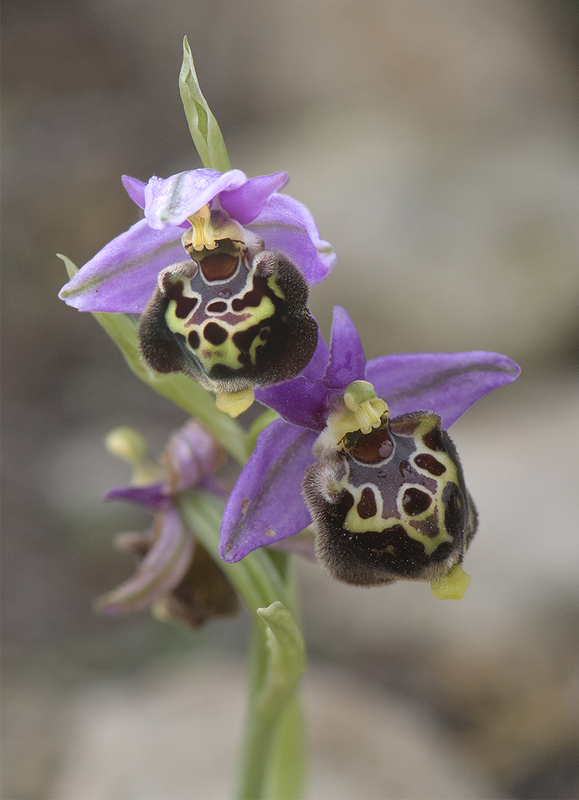 We therefore decided to change plans for our last excursion and start next day by visiting the Ophrys halia site. This, our last day at Rhodes, became a nice and sunny day. We started the day, as decided the night before, by visiting the area where the Belgian had found Ophys halia. This meant that we started as we did the day before, via Gennadi, Vati and Arnitha. Using the map sketch at the napkin, there was no problem finding the plant. Some species from our first stop, the "halia"-site. From the beginning it was meant that we should chose Route 6 that would have taken us back to Profitis Ilias. We didn’t want to let this go completely, and therefore chose to drive towards the west coast of the island and follow this up toward Profitis Ilias and there meet the originally planned route. Since we wanted to be back home early in the afternoon, to start packing for tomorrow's home trip. Today's trip became therefor more like a sight-seeing, but a very nice one. During the day we saw a part of the nature at the western side of the island that was not the same as the eastern or central part, where our excursions had been concentrated. Or what about a lunch, sitting in a sunny slope overlooking the Aegean Sea and the islands off the coast. 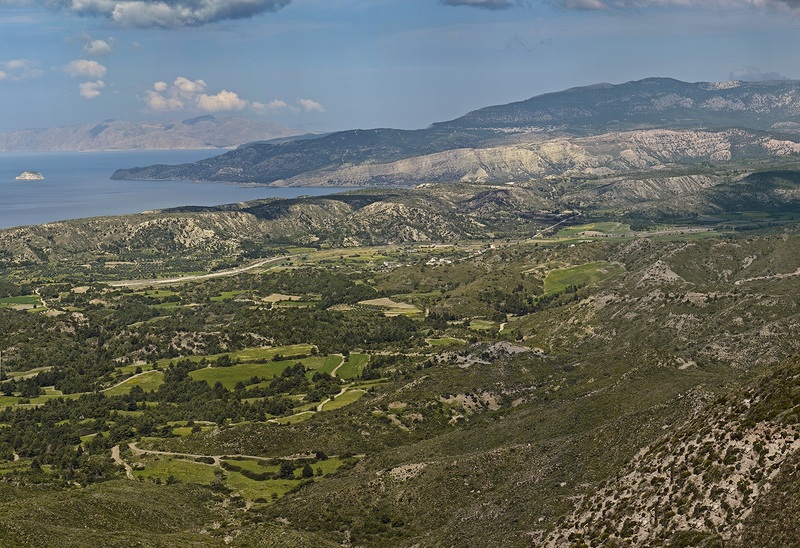 We also passed through the picturesque villages of Monolithos, Siana and Embonas before we went on to Profitis Ilias. This time we chose to drive to the left where we at Tuesday had driven right towards Childrens Camp. The road goes north of the highest peak along the northern slopes and here we made the second and last stop for the day. We searched the slopes to the right of the road. The area consisted of sparse mixed forests with low vegetation on the bottom. 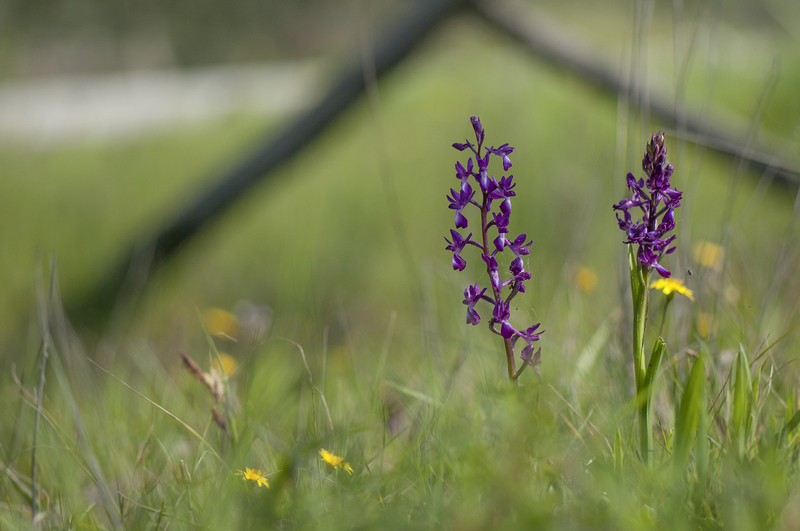 Here we found our last new species for the trip, Anacamptis morio subsp. caucasica, which here was seen in a large amount, along with Neotinea lactea and Orchis provincialis. Especially the latter was very abundant. Due to the time of the day, we decided to skip the other sites at route 6 and instead drive home. Since we had to start the next day at 04.30 A.M. we needed some afternoon time for packing before we should have our last dinner at a nice restaurant in Lardos, where we (almost) already had become regulars. Now that only the trip back home was left, a summary of our visit to Rhodes could be made, which could not be anything but "beyond expectation". In any case, the orchids, which were the reason for our trip, 46 species / subspecies was found and 3 alba-varities.